This blog post is the text of a short article written for the magazine of the German Federal Cultural Foundation, focused on Extinct in the Wild, an incredible project by the American artist Michael Wang. 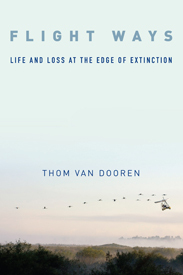 I’m delighted to announce that our new book is now out: Extinction Studies: Stories of Time, Death, and Generations. This collection was co-edited by Deborah Bird Rose, Matthew Chrulew and myself, and published by Columbia University Press. We have now finalised the manuscript for our forthcoming edited collection, Extinction Studies: Stories of Time, Death and Generations (to be published by Columbia University Press, available in May 2017). More information on the collection is available on the Edited Collections page of my website. This week our new special issue on “Multispecies Studies” appeared in Environmental Humanities. The issue was co-edited by six of us: Thom van Dooren, Ursula Münster, Eben Kirksey, Deborah Bird Rose, Matthew Chrulew and Anna Tsing. The full table of contents is below. Translocation, captive breeding, somatic cell nuclear transfer (cloning), back-breeding, gene and seed banking—the list goes on. Today, there are a whole range of different technologies and techniques aimed at holding on to, or even resurrecting, species that might already be thought of as “lost” in some significant sense. Continue reading Ethics in the Field: How far should we go to bring back lost species?